If there’s one thing that makes Australians cringe, it’s the use of Aussie clichés. Boomerangs, koalas, crocodile hunters and the term ‘sheila’ have been heinously exploited in eateries worldwide, with Hong Kong having its fair share in the form of kitsch bars and over-the-top steakhouses. Coast is the newest joint bringing an Aussie touch to SoHo and, thankfully, it’s steering clear of tired Australiana. Coast brings a taste of the modern Oz dining and drinking landscape that, although burgeoning Down Under, is relatively unknown beyond its borders. There are no shrimps on the barbie (because, in Australia, they’re called prawns), ‘bloke’-sized beers or even, gratefully, Foster’s. It’s not even focused on selling itself on the phrase ‘100% Australian beef’. 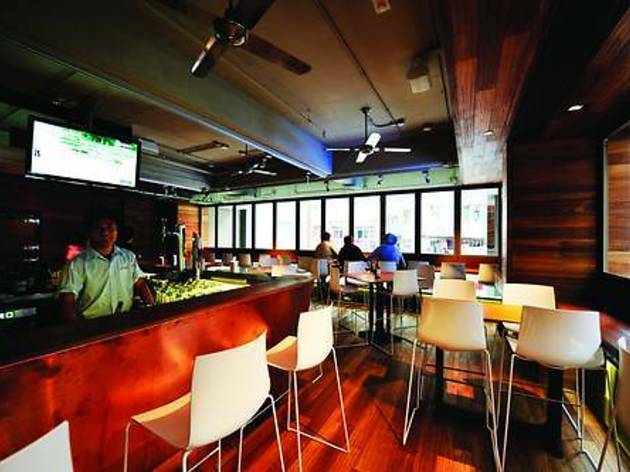 Elevated above Hollywood Road, in the new-ish Kinwick Centre, it recreates the feel of the modern, chic Aussie pub. The roomy dining area spreads to the left, with booths and a rectangular feature table filling the not-too-casual, not-too-chic space. To the right of the entrance is the all important bar. Although not massive, two broad windows that overlook the constant Wyndham Street-, Lan Kwai Fong- and SoHo-bound crowds provide an illusion of space, as well as one of the finest people-watching positions going around. Quite remarkably, Coast feels like it should be peering out over Sydney’s scenic Cockle Bay rather than the mouldy high-rises of Central. That’s partly because this new, prime positioned restobar was designed by the group behind some of Australia’s better known bars, including the remarkably similar Cargo at Sydney’s bustling King Street Wharf. Clean, light wooden tables and surprisingly comfortable high-chairs surround the island bar, with enough standing room in between when it gets a little rowdier and dancier. Judging by the classic Stevie Wonder and Jackson Five we heard, such behaviour is encouraged, although the feel is more casual than bars like Wagyu Lounge. 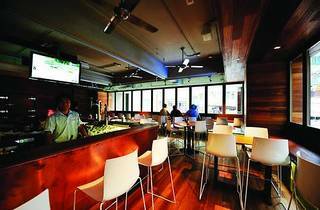 Drinks are central to the Australian experience, and at Coast, the focus is on the grape. The impressive but pricey wine list bears an overwhelmingly Australian flavour, featuring bottles from almost every significant wine producing region in the country: from the better known Margaret River and Barossa Valley areas, to fantastic niche locales such as Western Australia’s Swan Valley and Mount Barker. Try the excellent and fruity Goundrey Unwooded Chardonnay ($80), the d’Arenburg Feral Fox Pinot Noir ($100) or, if you’re cashed up, the most revered of Australian wines, the Penfolds Grange (enquire as to the price). The menu also features a significant selection of whites from its trans-Tasman rival, New Zealand. Although surprisingly cheap, Coast’s beer range falls a bit short of what you’d expect from an Australian gastropub. There’s VB on tap (served in schooners for that added New South Wales touch), Cascade Premium Light ($35), Crown Lager, and the low-calorie Pure Blonde ($37), all on hand to help wash down the grub. There are fancier things on the reasonably priced food menu, but try the Huntsman pie Aussie style, featuring kangaroo and pork chunk ($160) or the Angus steak sandwich ($140) for a touch of Oz classics gone gourmet.